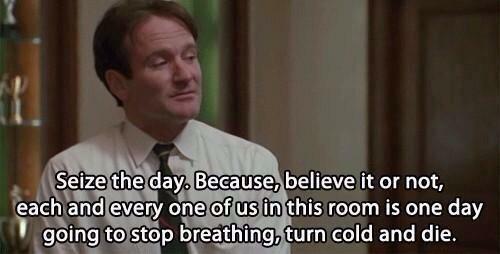 I grew up watching his movies and used to write down his movie quotes religiously. The ones I love the most was his Pablo Neruda bit from “Patch Adams”. But “Dead Poets Society” was my favorite too. I hope he did seize his days, regardless of the way he died. Such a sad day. Rest in love, Robin Williams. No one could ever take your place. That’s why you’ll surely be missed. I love you without knowing how, or when, or from where. I love you straightforwardly without complexities or pride. I love you because I know no other way then this. So close that your hand, on my chest, is my hand. So close, that when you close your eyes, I fall asleep. Turut berduka.. Film2nya beliau berkualitas menurutku. This entry was posted on August 12, 2014 by Teppy in Thoughts and tagged Dead Poets Societ, Pablo Neruda, Patch Adams, Quotes, RIP, RIP Robin Williams, Robin Williams.